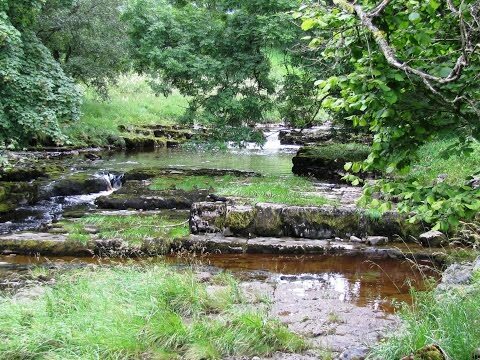 Langstrothdale is a beautiful and peaceful valley in the Dales of North Yorkshire and the upper part of the River Wharfe runs through it for its first 15 miles, although Wharfedale begins where the river meets the small village of Cray. Langstrothdale has three hamlets Beckermonds, Yockenthwaite and Hubberholme. The views down this valley are spectacular. Yockenthwaite is a small hamlet and lies on the north bank of the River Wharfe and nearby is a stone circle, an area of ancient stones arranged in a circle thought to be the kerbstones of a ring cairn. Yockenthwaite is also known for a children’s television character in The Rottentrolls who takes its name from the hamlet. Yockenthwaite the character is a lovable and daft Rottentroll and often called Berk by the other Rottentrolls who are also named after places in Yorkshire. Cray is a very small hamlet situated on a steep hill above Wharfedale and consists of a few farms and a pub, the White Lion Inn. Cray is renowned for several attractive waterfalls known collectively as Cray Waterfalls. The White Lion Inn located beside the cascading Cray Gill below Buckden Pike is a warm and welcoming inn with original oak beam’s, stone flagged floors and an open log fire. It also has B&B accommodation. Hubberholme is an old interesting village situated at the point where wharfedale becomes Langstrothdale and houses a pub The George Inn and an old Norman church. The inn which looks over the River Wharfe is the last remaining family owned freehouse in the parish of Buckden and is one of the few un-modernised inns in the Yorkshire Dale. The inn with its thick stone walls, flagged floors, mullioned windows and a coal fire is a grade II listed building and was first built in the 1600’s as a farmstead. It was also once a vicarage and when the vicar was at home he would leave a lit candle in the window, the candle was also used in the annual land letting auction for centuries and today tradition is still carried out by leaving a lit candle in the window whenever the bar is open. The 12th century church dedicated to St. Michael and All Saints was originally a forest chapel within the Norman hunting forest of Langstrothdale Chase and was given to the monks of Coverham Abbey in 1241. The very rare Rood Loft brought here from Coverham Abbey in 1558 is one of only two roofs remaining in Yorkshire the other being at Flamborough on the east coast. The oak pews were built by the famous Mousey Thompson of Kilburn and the ashes of author and playwright J.B. Priestley are scattered in the churchyard. We park at the side of the road at Yockenthwaite and walk back to cross the bridge to Top Farm and bear right and left through the buildings following the footpath sign, Cray 3 miles. At the next footpath sign we leave the farm track heading forwards on the grass then bearing right at the back of the buildings. We walk uphill and then take the footpath on the right, sign posted Hubberholme and Cray, through a gate and follow the path with wonderful views of the valley on our right. We pass a stone barn on our left and keep heading forwards through fields and broken down dry stone walls until we come to a wood in front of us and head uphill slightly to take a gate on the right into the wood and immediately cross a little bridge over a deep gully. We keep following the path then come out into the open with the wood on our right and soon we go through a gate and take the footpath on the left for Cray and head forwards round the hillside with wonderful views of Wharfedale. We go through the gate in the next wall and keep following the grassy path round the hill we see in front of us until we come to a bridge over a gill on our right. We cross the bridge and turn right and follow the path past the farm buildings to the road at Cray. We cross the road to take a look a Cray Gill and the White Lion Inn before we retrace our steps back up the track at the side of the pub for a short way and take the path on the left at the sign post and go through the stile on the left of the building. We go through the gate at the end of the building and follow the path on the open hill side then through some trees and then alongside Cray Gill heading downhill to Stubbing Bridge where we turn right and walk on the road until we come to Hubberholme. At Hubberholme we take the track on the right just before the church sign posted Dales Way Footpath Yockenthwaite 1 ¾ miles we head forwards and turn left and at the next sign post and where the track splits into two we take the footpath on the left. We now follow the Dales Way close to the River Wharfe back to the bridge at Yockenthwaite and to our car. This is a moderate walk on minor roads, grassy and stony paths with some quite steep inclines and declines. Yockenthwaite is in Langstrothdale in the Yorkshire Dales. From the A1 take the A684 through Leyburn and before reaching Aysgarth take B6160 for Cray and Grassington. Just after Cray take a right turn to Yockenthwaite OR from the A1 take the A61 to Ripon then take the B6265 through Pateley Bridge and Grassington then turn right onto the B6160 through Kettlewell and at Buckden take the left turn to Yockenthwaite. There are no public toilets the nearest ones are at Buckden. For refreshments there is the White Lion Inn at Cray and the George Inn at Hubberholme. There is also the Buck Inn at nearby Buckden. Usually posts some extremely exciting stuff like this. If youre new to this site….